What Happens When You Pray? How can you connect more deeply with God, whether you're new to prayer or have been praying for years? Are there problems or concerns too small for God? 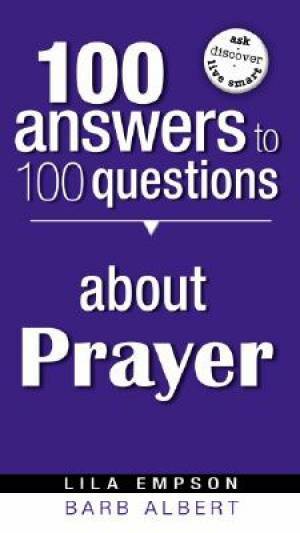 100 Answers to 100 Questions About Prayer reveals the astounding purpose and power of prayer and its vital role in your life-and in the lives of those you pray for. You'll find answers to all your questions, including . . . * Does God need you to pray? * Is there a format to use in prayer? * Does fasting make prayer more effective? * If there is no answer, did God say no? 100 Answers to 100 Questions About Prayer will be your encouraging and informative "prayer partner" as you learn to bring all your cares and joys to the God who loves you. 100 Answers To 100 Questions About Praye by Barb Albert; Lila Empson was published by Charisma House in August 2008. The ISBN for 100 Answers To 100 Questions About Praye is 9781599792743. Be the first to review 100 Answers To 100 Questions About Praye! Got a question? No problem! Just click here to ask us about 100 Answers To 100 Questions About Praye.